Based on satellite data and wind model data, the Darwin VAAC reported that on 10 April an ash plume from Kadovar rose to an altitude of 1.2 km (4,000 ft) a.s.l. and drifted SE and E.
The first confirmed eruption of Kadovar began on 5 January 2018 with dense ash plumes and steam and a lava flow. The eruption continued through February and then slowed during March (BGVN 43:04). 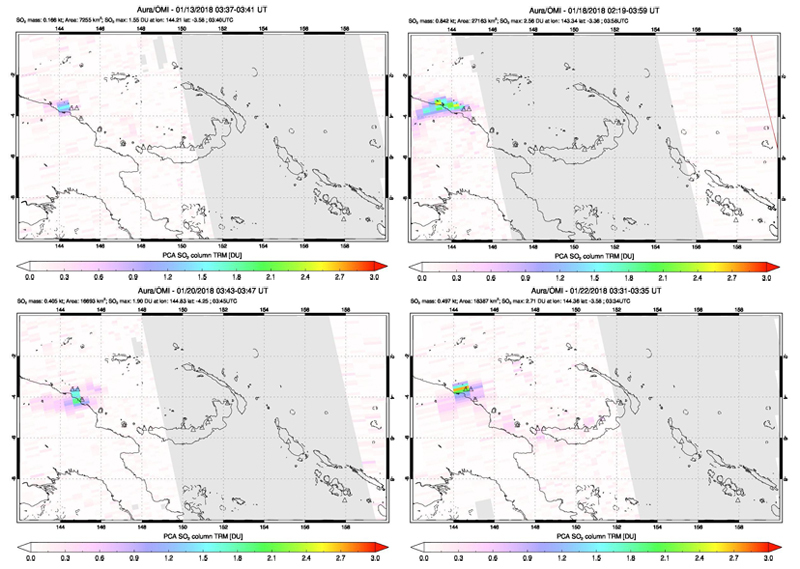 This report describes notices of ash plumes from the Darwin Volcanic Ash Advisory Centre (VAAC) and satellite images during April through 1 October 2018. According to the Darwin VAAC a pilot observed an ash plume rising to an altitude of 1.2 km on 10 June. The ash plume was not identified in satellite data. Another ash plume identified by a pilot and in satellite images rose to an altitude of 1.8 km on 20 June and drifted W. An ash plume was visible in satellite images on 28 September drifting SE at an altitude of 2.1 km. On 1 October an ash plume rose to 2.7 km and drifted W.
Infrared satellite data from Sentinel-2 showed hot spots in the summit crater and at the Coastal Vent along the W shoreline on 10, 15, and 25 April 2018; plumes of brown discolored water were streaming from the western side of the island (figure 18). Similar activity was frequently seen during clear weather in the following months. A steam plume was also often rising from the crater. The Coastal Vent cone was still hot on 8 August, but no infrared anomaly was seen in imagery from 28 August through September. Figure 18. Sentinel-2 natural color satellite image of Kadovar on 10 April 2018. The island is about 1.5 km in diameter. Steam can be seen rising from the summit and the Coastal Vent just off the western shore; both locations show thermal anomalies in infrared imagery. 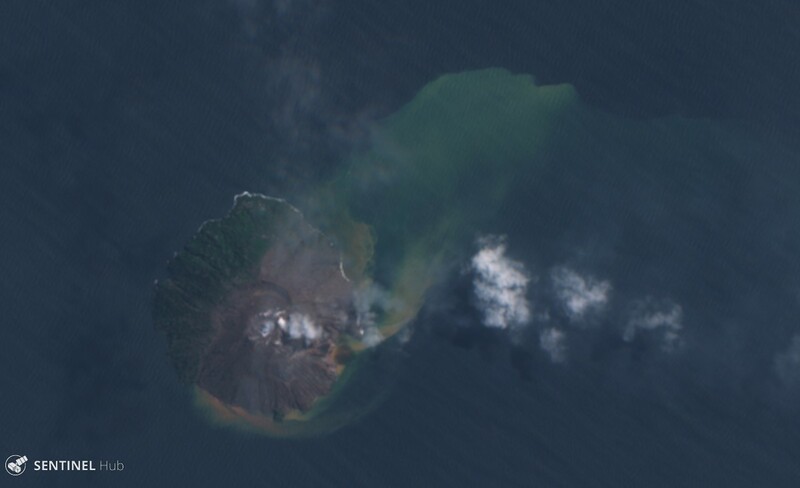 Discolored water plumes extend NE from the island. Courtesy of Sentinel Hub Playground. Information Contacts: Darwin Volcanic Ash Advisory Centre (VAAC), Bureau of Meteorology, Northern Territory Regional Office, PO Box 40050, Casuarina, NT 0811, Australia (URL: http://www.bom.gov.au/info/vaac/); Sentinel Hub Playground (URL: https://www.sentinel-hub.com/explore/sentinel-playground). Based on satellite data and wind model data, the Darwin VAAC reported that on 9 April an ash plume from Kadovar rose to an altitude of 1.5 km (5,000 ft) a.s.l. and drifted SE. Based on satellite data and wind model data, the Darwin VAAC reported that on 21 February an ash plume from Kadovar rose to an altitude of 1.8 km (6,000 ft) a.s.l. and drifted ESE. Based on satellite data and wind model data, the Darwin VAAC reported that on 16 February ash plumes from Kadovar rose to an altitude of 1.8 km (6,000 ft) a.s.l. and drifted ESE. According to Brad Scott of GeoNet, the Royal New Zealand Air Force released photos of a plume rising from Kadovar at 1640 on 10 February. Based on satellite data and wind model data, the Darwin VAAC reported that during 27-28 November ash plumes from Kadovar rose to an altitude of 0.9 km (3,000 ft) a.s.l. and drifted SE and E. On 2 December ash plumes rose to 1.2 km (4,000 ft) a.s.l. and drifted WSW and W.
The Darwin VAAC reported that discrete, low-level events at Kadovar regularly occurred on 14 November based on satellite data. Ash plumes rose to an altitude of 2.4 km (8,000 ft) a.s.l. and drifted E.
The Darwin VAAC reported that during 29-30 October intermittent ash plumes from Kadovar rose to altitudes of 1.8-2.1 km (6,000-7,000 ft) a.s.l. and drifted SW, S, and SE. According to the Darwin VAAC, ash plumes from Kadovar were visible in satellite images on 21 October drifting NE at an altitude of 2.4 km (8,000 ft) a.s.l. Based on satellite data and wind model data, the Darwin VAAC reported that during 10-12 October ash plumes from Kadovar rose to an altitude of 2.4 km (8,000 ft) a.s.l. and drifted NW and W.
RVO reported quiet conditions at Kadovar during 1-20 September with only diffuse white plumes rising from the volcano. Activity increased on 21 September and remained elevated at least through 26 September, the date the last visual observation was received by RVO. During the period if increased activity dense dark gray and brown ash plumes rose several hundred meters above the summit crater (700-800 m) and drifted NW. Intense incandescence from Main Crater, the SE coastal vent, and other areas was visible. Minor amounts of ash fell on Blup Blup island. On 1 October an ash plume rose to 900 m (9,000 ft) a.s.l. and drifted W. An ash plume was visible in satellite images on 3 October drifting W at an altitude of 2.1 km (3,000 ft) a.s.l. An ash plume from Kadovar was visible in satellite images on 28 September drifting SE at an altitude of 2.1 km (7,000 ft) a.s.l. On 1 October an ash plume rose to 2.7 km (9,000 ft) a.s.l. and drifted W.
According to the Darwin VAAC an ash plume from Kadovar identified by a pilot and in satellite images rose to an altitude of 1.8 km (6,000 ft) a.s.l. on 20 June and drifted W.
According to the Darwin VAAC a pilot observed an ash plume from Kadovar rising to an altitude of 1.2 km (4,000 ft) a.s.l. on 10 June. The ash plume was not identified in satellite data. RVO reported that emissions from Kadovar’s Main Crater were white from 1 March, until an explosion on 1800 on 5 March was followed by gray emissions through 8 March. The gray plumes rose less than 360 m above the vent and drifted SE. Noises were described as roaring and rumbling during 1-2 and 6-8 March, and booming on 5 March. 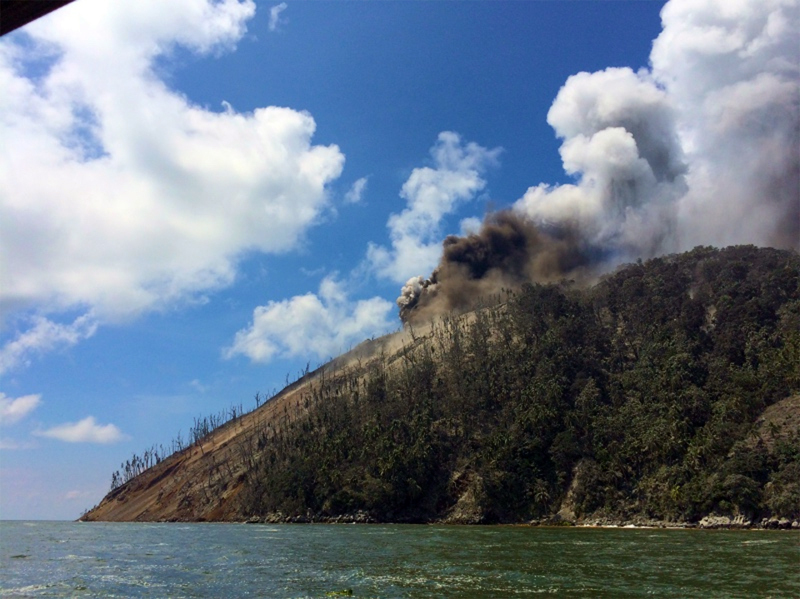 The lava dome at the SE Coastal Vent continued to grow and rose to 7-8 m above sea level on 1 March, 10-11 m on 2 March, and 10-17 m on 8 March. Dark gray ash plumes rose from the dome. Nighttime incandescence was noted from both Main Crater and the SE vent. According to the Darwin VAAC a pilot observed an ash plume from Kadovar on 2 March drifting SE at an altitude of 4 km (13,000 ft) a.s.l. 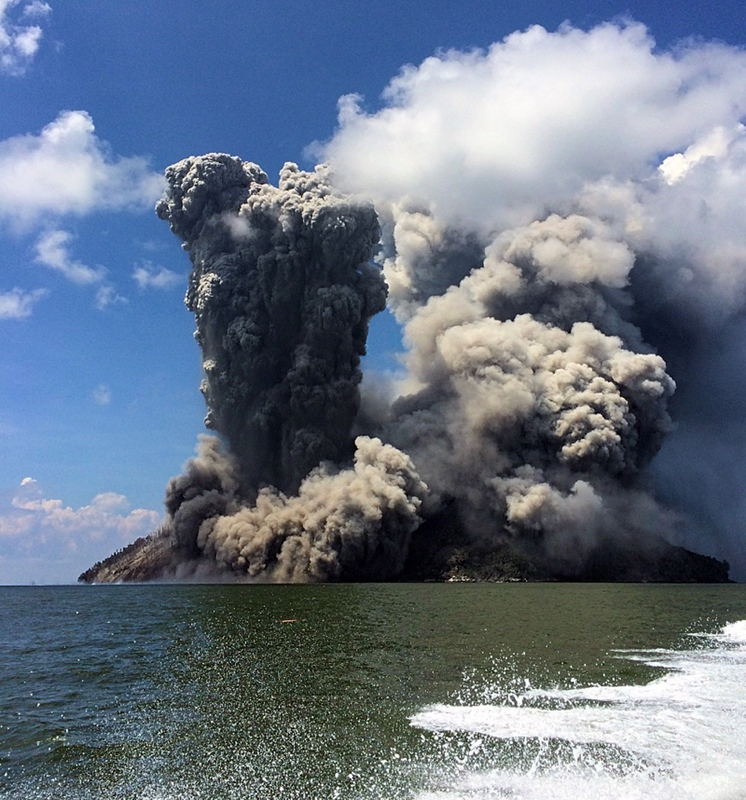 RVO reported that lava continued to flow from the SE Coastal Vent resulting in the connection of a reemerged lava island to the coast of Kadovar within a few days of the 1 February collapse. During 14-22 February continuous plumes of white vapor rose from both Main Crater and SE Coastal Vent, punctuated by dense ash emissions from both areas during 16 and 20-22 February and occasional booming noises. Ash plumes rose 370 m above the island and drifted SE, though on 22 February the winds blew the plumes N and NW. Incandescence from both areas was visible on 22 February. A sulfur odor was noticed by residents on Blup Blup (15 km N) on 16 and 22 February. 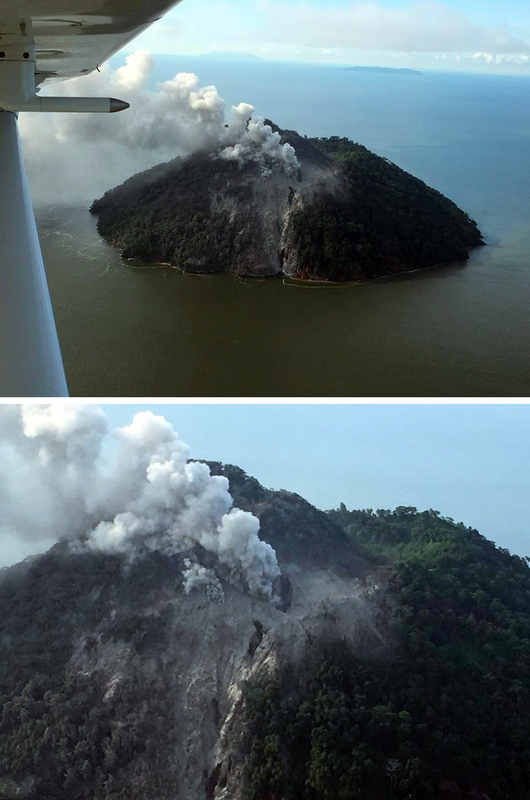 RVO reported that on 9 February the lava dome at Kadovar’s SE Coastal Vent collapsed, causing 5-6 minor tsunamis, less than 1 m high, observed by residents on Blup Blup’s E and W coasts. The waves were reported at 1050, before the main collapse of the dome. In a 12 February report RVO noted that activity from Main Crater consisted of white plumes rising 20 m and drifting a few kilometers SE and weak nighttime crater incandescence. RVO reported that the eruption at Kadovar continued during 31 January-1 February at a low level. Sulfur dioxide emissions and seismicity had both decreased. Dense white vapor plumes rose 100 m from Main Crater and drifted SE. Continuous but dull glow emanated from the crater. The lava dome at the SE Coastal Vent continued to grow. A new lobe 20-30 m long grew out from the seaward side of the dome boundary, channeled by levees which had developed on the sides of the dome. White steam plumes rose 100 m above the island and drifted SE. At 1830 on 1 February a collapse of the N part of the dome produced a gray plume, vigorous steaming at the collapse site, and nighttime incandescence. The main part of the dome had bulged up, and a valley developed in between the dome and the island’s flank. RVO reported that the eruption at Kadovar continued during 23-24 January at levels similar to the previous few days. Main Crater produced light-gray to brown ash plumes that rose at most 100 m and drifted a few tens of kilometers W. Weak incandescence from Main Crater was visible at night. The lava dome at the SE Coastal Vent continued to grow and was an estimated 50 m a.s.l. (the water depth in that area was unknown) and extends out from the coast 150-200 m. The dome glowed red at night. Seismicity was low to moderate, with one high-frequency event, and 12 significant numerous small low-frequency events. Strong sulfur dioxide emissions were detected. RVO reported that the eruption at Kadovar continued during 18-19 and 21-22 January. Main Crater produced ash plumes that rose as high as 800 m above the summit and drifted tens of kilometers E, SE, S, and SW. Vulcanian activity was continuous, though no discrete explosions were detected. Steam plumes from the SE Coastal Vent rose 800 m above the island, and a lava dome which strongly and continuously glowed at night slowly extruded from the vent. Strong sulfur dioxide emissions were detected. Kadovar is a 365-m-high, 1.4 km-diameter volcanic island. A 1700 report of smoke seen briefly there was believed at the time to be a volcanic eruption. Since then no eruptions are known, and no traces of thermal activity remained in early 1976, although there was supposedly some such activity several generations ago. The island has the form of a steep-sided cone 250 m high, with a 600-m-wide crater breached to the SSE. The breach probably extended at least to sea level, but the crater and breach are now occupied by a high-standing, conical lava dome. The island is completely vegetated, and supported a village of more than 300 people built around the crater rim. Most of the village gardens are on the side of the dome. In early August 1976, the first reports were received of activity there, the precise nature of which has not been clearly established. A summary of events to mid-November, and of investigations so far carried out, follows. May-June 1976. The precise nature of the early events is not clear. Some sort of disturbance seems to have taken place in the sea just off (50 m?) the S coast, which may have been a small hydrothermal eruption or, more likely, a vigorous ebullition of gas bubbles. Weak earth tremors were felt, apparently during the preceding few days, and an explosive sound was heard. Scum was noticed on the water, persisting for a few days, and reddish coloration appeared on the rocks in the tidal zone at one point on the S coast. August 1976. 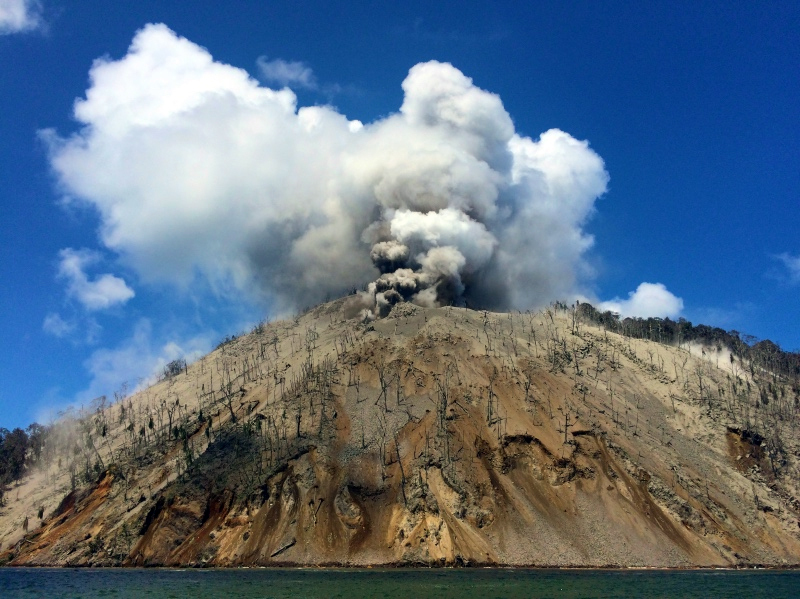 An investigation [on 3 August] was made by Rabaul Volcano Observatory (RVO) volcanologists D. Wallace and R. Almond. The only effect of the earlier activity was a 100 m-long reddish zone of iron hydroxide discoloration at sea level, and associated sea discoloration. No thermal activity or other unusual phenomena were observed, and no definite volcano-seismic activity was recorded during 5 hours operation of a portable seismograph. September 1976. Hot ground was first noticed midway up the side of the lava dome about 16 September. An investigation [on 26 September] was made by volcanologist R. Cooke. The coastal discoloration was more extensive than in August, and ground temperatures up to 49°C were present in this zone. The reported hot ground on the mid-slope of the dome was about 30 m x 15 m in area, and was producing vigorous emissions of SO2 and HCl gases (indicated by Dräger tubes) from one main vent and numerous minor vents, at temperatures up to 99.7°C. The white gas column was visible above the treetops from the boat, but only minor vegetation damage had occurred. A newly formed small, weak patch of hot ground was found 100-200 m upslope of the main fumarole area. No volcano-seismic activity was recorded during 5.5 hours with a portable seismograph. October 1976. Government officers R. Allen and D. Mahar from Wewak inspected the fumarole area [on 14 October], which had intensified in activity and was about 150 x 50 m in area. The expansion had proceeded principally upslope. [On 23 October] D. Mahar again inspected the fumarole area, which had further enlarged. All vegetation in the area had been killed. November 1976. An investigation [during 10-12 November] was made by volcanologist V. Dent, physicist D. Norris (University of Papua New Guinea, Port Moresby), and D. Mahar. The main fumarole area had enlarged again and was estimated at about 150 x 70 m, and the area of dead vegetation was more prominent. A second main fumarole vent had developed 20 m downslope of the original main vent of September, but the principal expansion since then had been upslope, and to the E. The maximum temperature measured was again about 99°C. Collections of fumarole gas were made in evacuated glass tubes containing silica gel, and gas condensates were also collected. The maximum ground temperature in the S coast discolored zone was 49.5°C, similar to September. About 50 hours recording by a portable seismograph produced 5-10 very small and close A-type events. A seismic event counter was installed on the island. D. Norris carried out a total magnetic field survey of the island using a proton magnotometer. It is intended to continue regular inspection visits to the volcano, but a full-time observation post is not planned at this time. Such a post will be established, probably on Blupblup Island, 13 km north of Kadovar, when an eruption is believed to be imminent, or once an eruption has commenced. 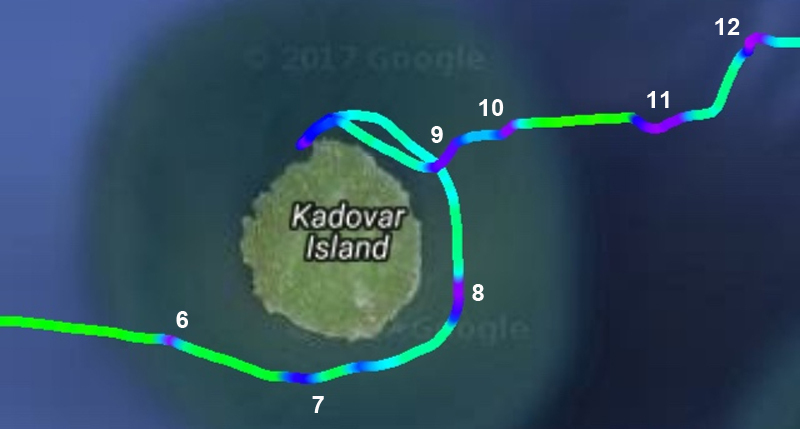 All residents of Kadovar have been evacuated to Blupblup Island. Information Contacts: R. Cooke, RVO. "Since the previous report, five more ground inspections have been made, and a sixth is planned for the last week in April. Complete investigations, including temperature measurement, collection of gases and gas condensates, measurement of magnetic field, and seismic recording, were made during visits on 15-16 December (Cooke, Norris), and 16-18 February (Dent, Norris), and are planned for the forthcoming visit (Cooke, Norris). Partial investigations were made on 3 April (Wallace), when temperatures and gases were investigated, and on 26 January (Mahar) and 14 February (volcanological assistant J. Kuduon), when temperatures were measured. Vertical aerial photographs were taken by a survey firm on 15 November, and aerial obliques were taken during the December inspection. Another aerial inspection was carried out on 7 January, the day after a shallow M 6.5 earthquake about 30 km WSW of Kadovar on 6 January, 0611 GMT (preliminary location by USGS). This earthquake had no apparent affect on the volcano at the time. "During the period covered by this report, the level of activity seemed to have stabilized. Maximum temperatures have been steady at 99-100°C, marked expansion of the main thermal area has ceased (although weak isolated gas vents are still occasionally found in new areas), and the quantity of gas emitted may even have declined slightly. The thermal area was not as unpleasant to the investigators as it was last November-December, although as some gas samples have not yet been analyzed quantitative information on the changing gas content is not available. "No significant magnetic field changes have been detected. A few volcano-seismic events were recorded in both November and December, but such events appeared to be absent in February. Felt earthquakes were noted by inhabitants of nearby islands on several occasions, but there is no strong reason to associate these with Kadovar volcano. Unusually high seismic event counts on Kadovar are suspect because of a malfunctioning event counter. "Although the initiation and early rapid development of this thermal activity led to the belief in a forthcoming Kadovar eruption, the stabilization (or even slight decline) in activity suggests the possibility that the event may be confined to thermal activity. Such purely thermal events have been reported elsewhere. However, the event will continue to be treated as a possible precursor to an eruption, and the former inhabitants will be advised to maintain the evacuation for the present. Only a small number of men are presently living on Kadovar in order to maintain the original gardens, to supply the evacuees on Blupblup Island. It is interesting to speculate that the 6 January earthquake may have been connected with the levelling-off of activity." "Three detailed investigations have been made since the March report: 25-28 April (Cooke, Norris) 72 hours of seismic recording, gas condensates collected, temperatures measured, and magnetic field re-surveyed; 7-8 June (Dent) 30 hours seismic recording, temperatures measured, and gas and gas condensates collected; and 7-8 July (Wallace, Norris, Emeleus) 30 hours seismic recording, temperatures measured, gas and gas condensates collected, and magnetic field re-surveyed. "The main thermal area has been little changed during this period. The original fumarole of last September shows the same degree of activity as it did then. Volcano-seismic activity was virtually nil. Maximum temperatures were still 99-100°C but there may have been slight changes in the magnetic field pattern. The only features presently indicating continued development are weak thermal areas that are still being established in new areas on other parts of the island. Some of the population have returned, contrary to a previous report, but they have established a new settlement in a comparatively safe area, having abandoned their old village site." Information Contacts: D. Wallace, RVO. "Volcanologists have made three detailed investigations at Kadovar since the report in July. On each occasion, temperatures were measured, gases and gas condensates were collected, and seismic recording was carried out; a magnetic resurvey was made during the most recent inspection. Dates and personnel were: 18-19 August, V.F. Dent; 30 September, C.O. McKee; 13-14 November, C.O. McKee and D. Norris. On 14 September, photographs were taken during an aerial inspection. "The main thermal area was much the same size as before, apart from some expansion at the SW corner, and spanned about 250 m upslope, and about 130 m maximum around the slope. It is now much more sharply defined and clear because of progressive fall of dead vegetation. Overall vapor emission seemed much less than in earlier periods, and was more concentrated in a few main areas, with fewer of the weak but widespread vents evident in early 1977. The original main fumarole may be a little reduced in intensity, although its temperature has not declined, remaining near 100°C. No measured temperatures exceeded 100°C, although the upper part of the main zone has become hotter, approaching 100°C. Vapor emission was still most profuse in the upper part. "No volcano-seismic activity has been recorded during the report period, and although significant relative changes in total magnetic field have taken place, no simple pattern is apparent." Thermal activity was continuing in late March. An aerial inspection 21 March and a ground inspection the next day revealed that although principal fumaroles remained at the same level of activity as before, a slight decrease of activity in the main (S flank) thermal zone is indicated by minor revegetation. The odor of acid gases was no longer present at several groups of fumaroles and temperatures have dropped slightly (from 100 to 97-97.5°C). However, another area of thermal activity (high on the E side of the lava dome) had produced a significant vegetation kill in the past few months. Kadovar's thermal activity was continuing as of 20 September, but had shown a further slight decline since March. "An area of orange discolouration of the sea at the NE shore was observed during aerial inspections on 6 and 19 March. Previously (1976-77) sea discolouration was present at the S shore and was related to the development of a new thermal area on the S flank of the island. This thermal area was now observed to have been reduced in size by regrowth of vegetation." Information Contacts: Acting Senior Volcanologist, RVO. 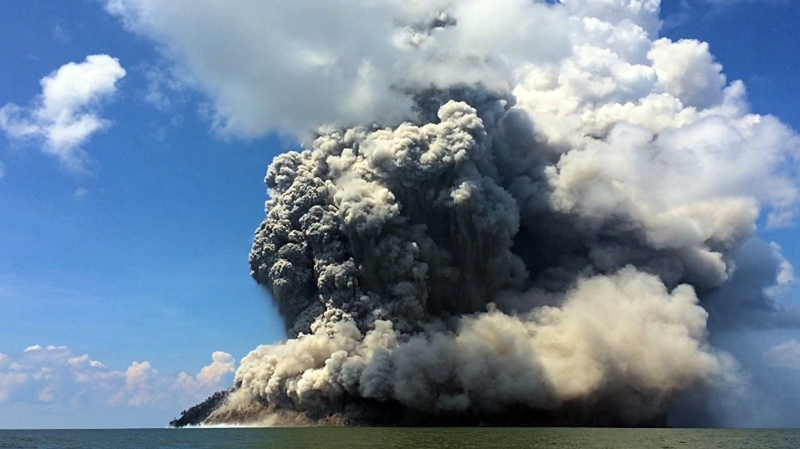 The first confirmed historical eruption at Kadovar began around mid-day local time on 5 January 2018, according to witnesses. The steeply-sloped island is approximately 1.4 km in diameter and is located about 25 km NNE from the mouth of the Sepik River on the mainland of Papua New Guinea (figure 1). This report covers activity from the beginning of the eruption on 5 January through March 2018. 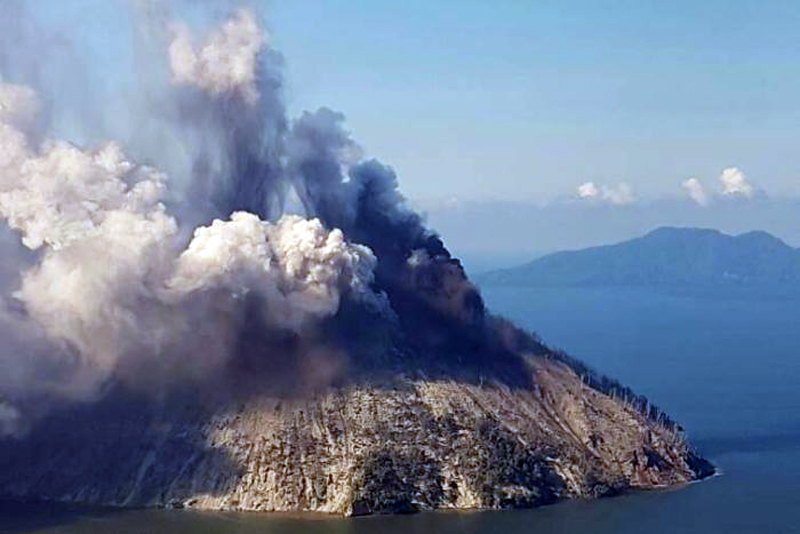 Information about the eruption is provided by the Rabaul Volcano Observatory (RVO), the Darwin Volcanic Ash Advisory Center (VAAC), satellite sources, news reports, and local observers. A possible eruption was witnessed by explorers in 1700; no other activity was reported until an outbreak of thermal activity in 1976 (NSEB 01:14-01:11, SEAN 03:09) and a short period of seismic unrest in 2015, according to RVO. Figure 1. Kadovar Island is located about 25 km NNE from the mouth of the Sepik River on the mainland of Papua New Guinea. 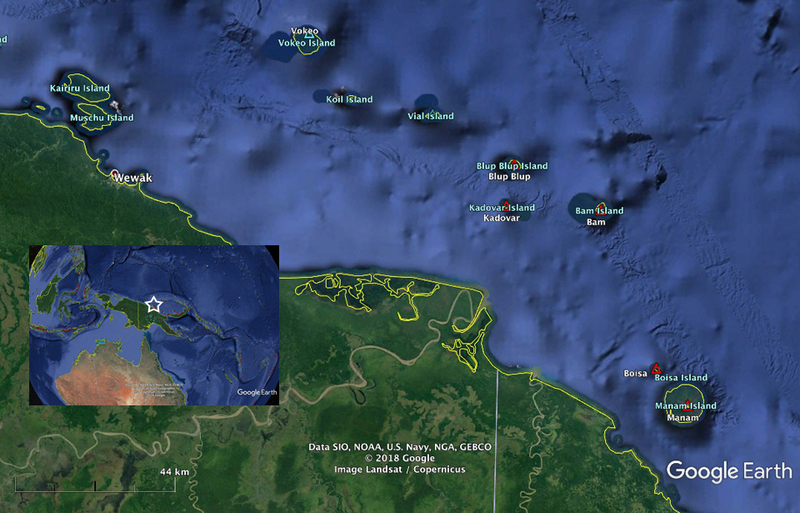 Nearby active volcanoes include Blup Blup (12 km N) and Bam (21 km W); residents of Kadovar were evacuated initially to Blup Blup before being moved to an area near Wewak, the nearest community on the mainland, about 105 km W. The red triangles are Holocene volcanoes, and the blue (cyan) triangles are Pleistocene volcanoes. Base map courtesy of Google Earth. Ash and steam emissions from Kadovar were first reported on 5 January 2018. After about 24 hours, more than half of the island was covered by volcanic debris. Activity intensified over the next two weeks; RVO identified five distinct vents located at the summit and along the SE coast. Dense ash plumes and steam rose from the summit vents, and a slowly-extruding lava flow emerged from a vent near the shoreline on the SE flank. Persistent steam and intermittent ash plumes were produced from the summit vent through the end of March. The lava flow grew outward from the shore for tens of meters before collapsing in early February, but it reappeared a few days later. By the end of the first week of March 2018 the flow was about 17 m above sea level; its growth rate had slowed, adding only one meter by late March. The NOAA/CIMSS Volcanic Cloud Monitoring system generated an alert for an ash cloud moving WNW, as imaged by S-NPP VIIRS, at 0330 UTC on 5 January 2018; Himawari-8 imagery subsequently showed that the eruption began around 0220 UTC. 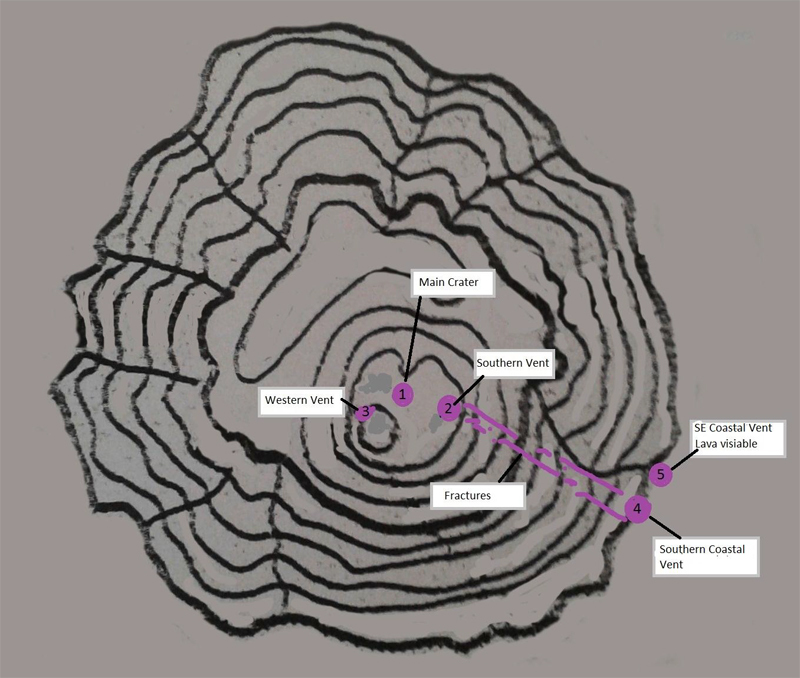 The Darwin VAAC reported two discrete ash plumes drifting W at 2.1 km altitude during the day. After local reports of the eruption Samaritan Airlines flew administrators from the Wewak district to investigate, enabling photographs of ash and steam emissions (figure 2). Figure 2. Steam and ash emerged from a vent near the summit of Kadovar Island and drifted WNW on 5 January 2018. The view is looking NW with the SE flank of Kadovar in the foreground. In the upper photo, the island in the background is Viai Island about 30 km NW. Photo by Ricky Wobar, administrator of the Wewak district. Courtesy of Samaritan Aviation, posted on Facebook on 5 January 2018. The following day, 6 January 2018, photos from a Samaritan Air flight showed that dark gray ash and steam plumes rising from a crater on the SE side of the summit had intensified (figures 3 and 4). It was estimated that 50 or 60% of the island was covered in volcanic debris, which appeared to be primarily ash along with some pyroclastic flows. According to the International Federation of Red Cross and Red Crescent Societies (IFRC), the entire population of Kadovar, about 600 people who lived on the N side of the island, was relocated to nearby Blup Blup Island which is home to about 800 residents. 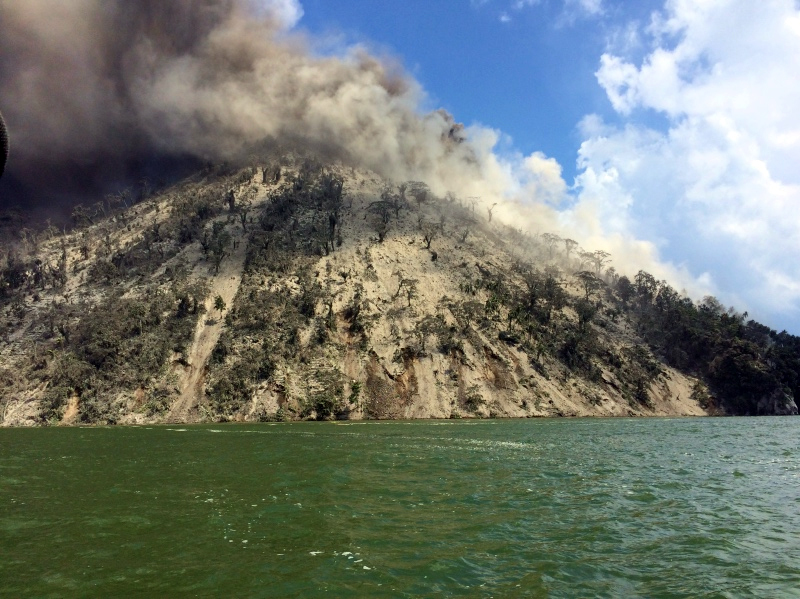 RVO reported minor ashfall on Kairiru and Mushu islands (115 km WNW), and on mainland Papua New Guinea at Mt. Uru in Yangoru (130 km W), Woginara (140 km W), and the Wewak District (100 km W). Figure 3. Ash and steam plumes rose from distinct vents on the SE side of the summit at Kadovar. View is to the NE, with Blup Blup volcano located about 12 km in the distance. Photo by Ricky Wobar likely taken on 6 January 2018, published by ABC News on 8 January 2018. Courtesy of ABC News. Figure 4. Ash and steam emissions intensified from vents at the summit of Kadovar Island on 6 January 2018. Posted on Facebook, 6 January 2018 by Samaritan Aviation. Also on 6 January 2018, missionary Brandon Buser set out from Wewak to visit Bam by boat. He observed the steam and ash plumes of Kadovar from about 75 km away. About 25 km W of the island, he felt falling ash. From a few hundred meters offshore he witnessed the ash and steam plumes rising from near the summit as he circled the S and E sides of the island (figures 5-8). Figure 5. Locations of the following photographs of the eruption at Kadovar on 6 January 2018 correspond closely to the purple spots where the boat slowed down on its trip around the island. North is to the top. Numbers indicate approximate locations of the following figures 6-12. Courtesy of Brandon Buser. Base map courtesy of Google Earth. Figure 6. An ash plume drifted NW from the summit of Kadovar as viewed from a boat a few hundred meters off the SW flank on 6 January 2018. Courtesy of Brandon Buser. Figure 7. Ash drifted WNW from Kadovar and also covered the vegetation on the SSW flank on 6 January 2018 in this view from a boat a few hundred meters off the SSW flank. Courtesy of Brandon Buser. Figure 8. Dark ash and white steam both rose from vents at the summit of Kadovar on 6 January 2018. Debris and ashfall killed and denuded the trees on the SE flank, and covered the ground. View is from a boat a few hundred meters off the SE flank. Courtesy of Brandon Buser. While preparing to head E to Bam, Buser witnessed an explosion that sent large plumes of ash and steam skyward from the SE flank, and a significant cloud of volcanic debris was ejected outward and down the SE flank; large boulders fell into the ocean. Heading rapidly E away from the eruption, he took additional photographs (figures 9-12). Figure 9. Dark gray ash and white steam billowed up from a vent near the summit of Kadovar on 6 January 2018 at the start of an explosion. The denuded vegetation and bare slopes on the SE flank indicated the extent of the recent activity. The view is from a boat a few hundred meters offshore of the NE flank. Courtesy of Brandon Buser. Figure 10. An explosion witnessed at Kadovar on 6 January 2018. Steam rose from a vent near the summit (right), dark gray ash billowed up from the SE flank, and brown dust and debris descended the SE flank into the ocean (left) in this view from a few hundred meters off the NE flank. Courtesy of Brandon Buser. Figure 11. A large explosion at Kadovar witnessed on 6 January 2018. Light gray steam and ash rose from near the summit and drifted NW covering the N half of the island in ash; a large eruption of dark gray ash shot upward from a different vent on the SE flank surrounded by dust and debris that traveled outward at its base. Larger debris caused splashing in the water off the SE flank (left). View is from a few kilometers off the NE flank. Courtesy of Brandon Buser. Figure 12. The plumes of steam, ash, and debris from the explosion moments earlier at Kadovar on 6 January 2018 rose and began to drift NW covering the island. Blocks landing in the ocean on the SE flank created spray along the shoreline (left). View is from a boat a few kilometers NE of the island. Courtesy of Brandon Buser. The Darwin VAAC reported on 6 January 2018 that a continuous ash plume was identifiable in satellite imagery moving W and WNW at 2.1 km altitude. By 7 January, the plume could be identified about 220 km WNW in satellite images (figure 13). During their return trip from Bam on 8 January 2018, the missionaries again circled the island and noted that the eruption seemed to be occurring from different vents. The island was covered in ash, and they became covered with wet ash as they traveled under the drifting ash plume. The Darwin VAAC reported the plume drifting WNW extending about 185 km on 8 January. They also noted that the influence of the sea breeze was also spreading minor ash to the SW. 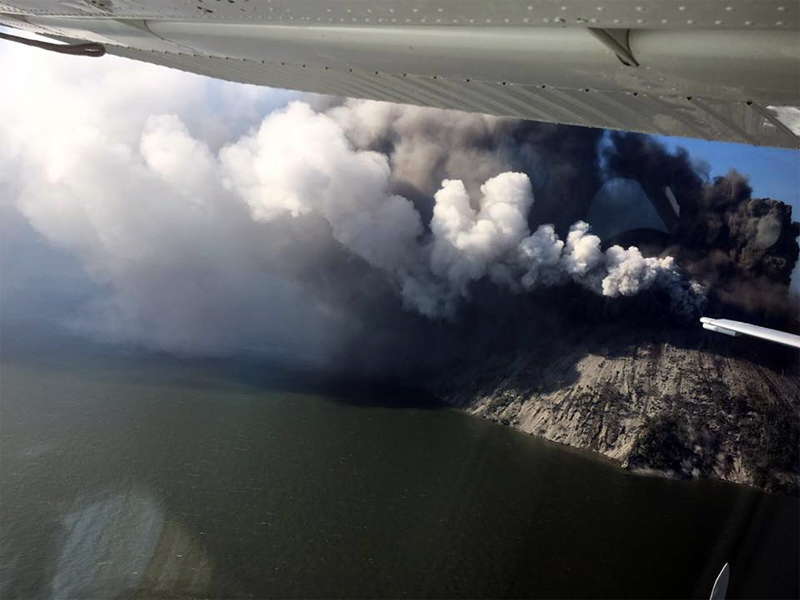 Continuous ash emissions were observed by the Darwin VAAC through 11 January, drifting W and NW at 2.1 km altitude. Figure 13. The Moderate Resolution Imaging Spectroradiometer (MODIS) on NASA's Aqua satellite captured the eruption of Kadovar that began two days earlier on 7 January 2018 as a plume of ash and steam that streamed NW from its crater. A second smaller plume, also drifting NW, is visible SE of Kadovar from unrelated activity at nearby Manam, one of Papua New Guinea's most active volcanos. 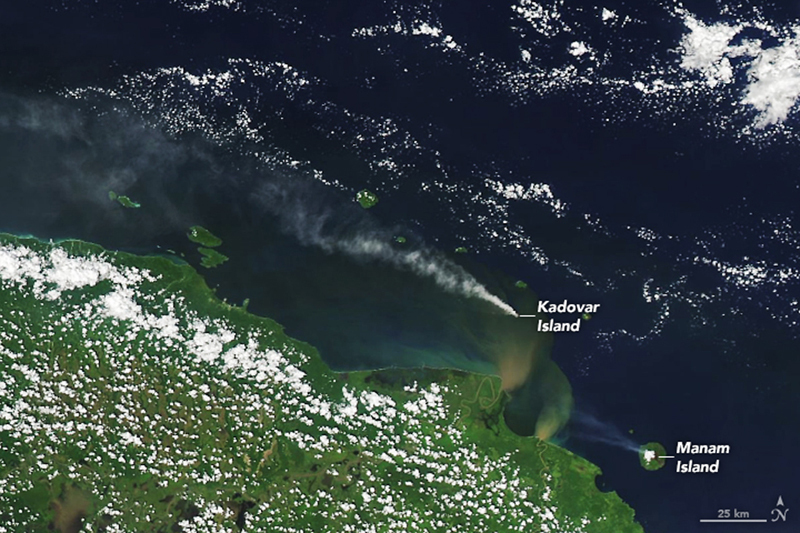 Brown-green plumes visible in the water S of Kadovar near the coast of the mainland, are caused by sediment from the Sepik and Ramu rivers on the mainland. Courtesy of NASA Earth Observatory. RVO reported a significant escalation in activity during 12-13 January 2018. An explosion during the previous night ejected large incandescent boulders from the fracture on the SE flank. Residents on Blup Blup (15 km N) could see incandescence high on the volcano's flank. During a flyover on 13 January, RVO noted variable steam and gas emissions rising to 1 km above the Main Crater and identified five distinct vents (figure 14). The SE Coastal Vent was very active with dense white steam emissions rising 600 m from the vent (figure 15). A dome of lava was visible at the base of the steam plume, but no incandescence was observed. The Southern Coastal Vent had been vigorously steaming a few days earlier, and RVO interpreted it to be the source of the incandescent blocks in the explosion a few days before. Figure 14. A sketch map of the five newly identified vents at Kadovar, 14 January 2018, from an RVO overflight the previous day. Courtesy of RVO (VOLCANO INFORMATION BULLETIN- No. 08 14/01/2018). Figure 15. A vigorous steam plume rose from the SE Coastal Vent at Kadovar on 13 January 2018 while an ash plume rose from Main Crater at the summit. Photo by the office of Allan Bird, Governor of East Sepik Province. Courtesy of RVO (VOLCANO INFORMATION BULLETIN- No. 08 14/01/2018). Reports of continuous ash emissions at 2.1 km altitude drifting WNW from the Darwin VAAC resumed on 16 January. A brief emission to 3.7 km was also noted that day. Pilot reports on 17 and 18 January indicated that ash was still in the area as high as 3-3.7 km altitude drifting W. The reports of emissions from the Darwin VAAC continued through 24 January. Ash emissions were generally continuous at altitudes from 2.4 to 3 km, although low level emissions of primarily steam and gas were observed on 20 January that included intermittent phases of increased ash content. The plume drift direction was variable, with periods when ash drifted S and SE in addition to the generally prevailing NW and W directions. During 18-22 January 2018, the Main Crater continued to produce moderate to dark gray ash plumes that rose 500-800 m above the summit, drifting locally S and SE, and a continuous steam plume from the SE Coastal Vent rose as high as 800 m above the island. An incandescent lava flow slowly extruded from the SE Coastal Vent. By the last week of January, the ash plumes were only rising about 100 m above the Main Crater and drifting W; weak incandescence was still observed at night. The white steam plume from the SE Coastal Vent rose closer to 400 m above the island. RVO estimated that the lava flow had risen to about 50 m above sea level and extended 150-200 m out from the coast. In their report on 2 February 2018, RVO noted that the lava flow continued to grow. A distinct lobe had pushed out from the seaward nose of the flow, by about 20-30 m; it appeared to be channeled by levees which had developed at the flow's sides. At 1830 local time on 1 February, a collapse of the side of the flow facing Blup Blup was observed; it resulted in a plume of gray ash and then vigorous steaming at the collapse site, which also was incandescent at night. The main body of the flow significantly bulged upwards, with a distinct 'valley' visible between the bulge and the island's flank. RVO reported that on 9 February the lava flow at the SE Coastal Vent had collapsed, causing 5-6 minor tsunamis less than 1 m high that were observed by residents on Blup Blup's E and W coasts. The waves were reported at 1050, before the main collapse of the dome. In a 12 February report, RVO noted that activity from Main Crater consisted of white plumes rising 20 m and drifting a few kilometers SE accompanied by weak nighttime crater incandescence. Activity renewed at the SE Coastal Vent shortly after the collapse of the flow on 9 February 2018; lava re-emerged a few days later, connecting a lava island to the coastline again. 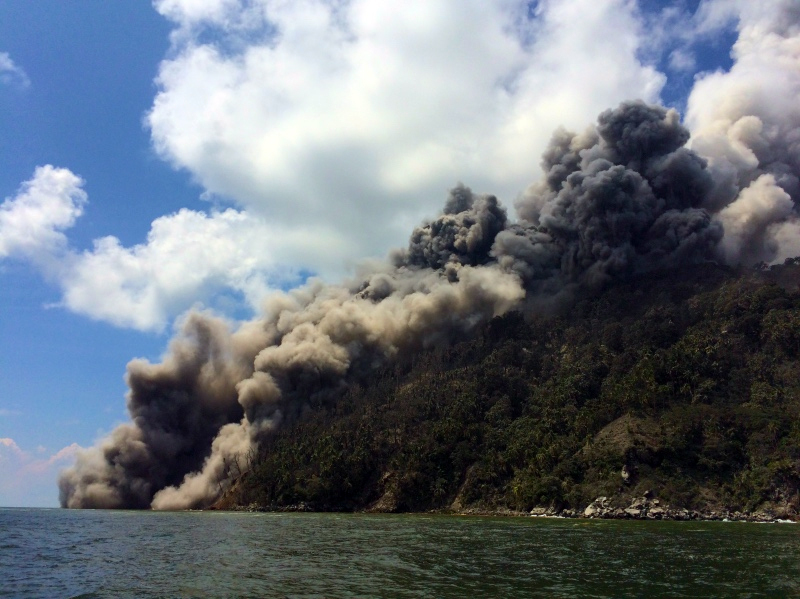 Continuous steam emissions from both the Main Crater and the SE Coastal Vent were interrupted by dark ash plumes on 16 and 20-22 February, and occasional explosions were heard by residents on nearby islands. Minor ashfall was reported on Blup Blup on 21 and 22 February. Eruptive activity continued during March 2018, although at a slower rate. 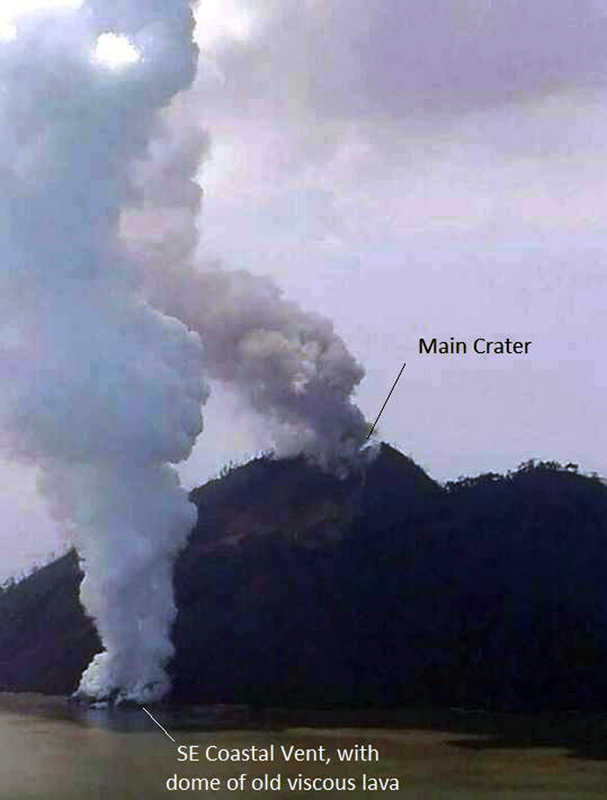 The Main Crater generally produced continuous emissions of white steam and intermittent explosions with dark ash plumes; incandescence was usually visible at night from Blup Blup. According to the Darwin VAAC, a pilot reported an ash plume at 3.9 km altitude drifting SE on 2 March; it was not visible in satellite imagery due to meteoric clouds. The lava flow extruding from the SE Coastal Vent continued to grow, creating a dome that grew from 7-8 m above sea level to 10-17 m above sea level by 8 March. Dark ash emissions from the vent and nighttime incandescence were common. The growth rate slowed later in the month, and only one meter of change was observed between 10 and 20 March. Satellite data. The MIROVA project recorded thermal anomalies from Kadovar in early January and early March 2018 (figure 16). MODVOLC thermal alerts were issued on three days; 15 and 22 January, and 7 February 2018. During January, small SO2 plumes were recorded by NASA satellites on four occasions (figure 17). Figure 16. The MIROVA project thermal anomaly graph for Kadovar from 11 May 2017 through March 2018. The first anomaly in early January 2018 correlates with observations of the first reported explosion. Courtesy of MIROVA. Figure 17. SO2 plumes from Kadovar were detected several times during January 2018 by the OMI instrument on NASA's Aura satellite. Courtesy of NASA Goddard Space Flight Center. Information Contacts: Rabaul Volcano Observatory (RVO), Geohazards Management Division, Department of Mineral Policy and Geohazards Management (DMPGM), PO Box 3386, Kokopo, East New Britain Province, Papua New Guinea, Contact: steve_saunders@mineral.gov.pg, ima_itikarai@mineral.gov.pg; Darwin Volcanic Ash Advisory Centre (VAAC), Bureau of Meteorology, Northern Territory Regional Office, PO Box 40050, Casuarina, NT 0811, Australia (URL: http://www.bom.gov.au/info/vaac/); NASA Earth Observatory, EOS Project Science Office, NASA Goddard Space Flight Center, Goddard, Maryland, USA (URL: http://earthobservatory.nasa.gov/); NASA Goddard Space Flight Center (NASA/GSFC), Global Sulfur Dioxide Monitoring Page, Atmospheric Chemistry and Dynamics Laboratory, 8800 Greenbelt Road, Goddard, Maryland, USA (URL: https://so2.gsfc.nasa.gov/); NOAA, Cooperative Institute for Meteorological Satellite Studies (CIMSS), Space Science and Engineering Center (SSEC), University of Wisconsin-Madison, 1225 W. Dayton St., Madison, Wisconsin 53706, USA (URL: http://cimss.ssec.wisc.edu/); International Federation of Red Cross and Red Crescent Societies (IFRC) (URL: http://www.ifrc.org/); Samaritan Aviation (URL: http://samaviation.com/, https://www.facebook.com/samaritanaviation/); Brandon Buser (URL: https://ethnos360.org/missionaries/brandon-and-rachel-buser, https://www.facebook.com/brandon.buser.35); ABC News (URL: http://www.abc.net.au/news/2018-01-08/tsunami-warning-for-communities-near-erupting-png-volcano/9311544); Google Earth (URL: https://www.google.com/earth/). The 2-km-wide island of Kadovar is the emergent summit of a Bismarck Sea stratovolcano of Holocene age. Kadovar is part of the Schouten Islands, and lies off the coast of New Guinea, about 25 km N of the mouth of the Sepik River. The village of Gewai is perched on the crater rim. A 365-m-high lava dome forming the high point of the andesitic volcano fills an arcuate landslide scarp that is open to the south, and submarine debris-avalanche deposits occur in that direction. Thick lava flows with columnar jointing forms low cliffs along the coast. The youthful island lacks fringing or offshore reefs. No certain historical eruptions are known; the latest activity was a period of heightened thermal phenomena in 1976. Johnson R W, 1987. Large-scale volcanic cone collapse: the 1888 slope failure of Ritter volcano, and other examples from Papua New Guinea. Bull Volcanol, 49: 669-679. Taylor G A, 1955. 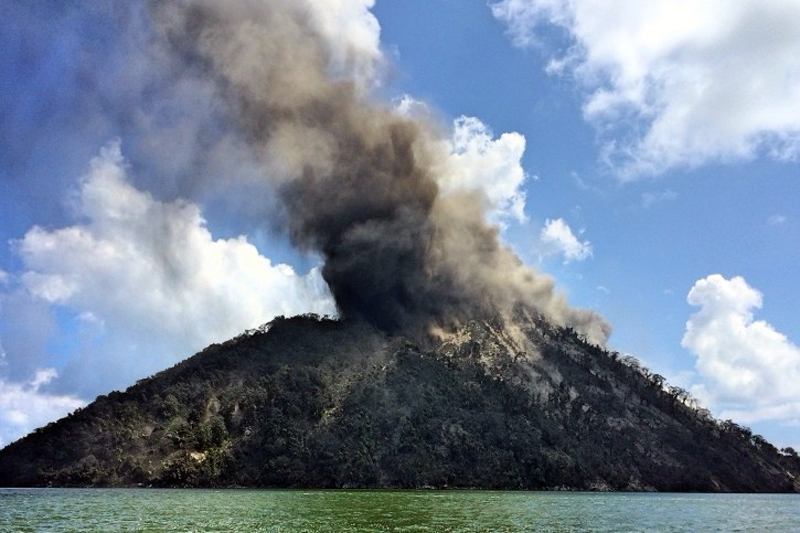 Report on Bam Island volcano and an inspection of Kadovar and Blup Blup. Aust Bur Min Resour Geol Geophys Rec, 1955/73: 1-9. Wallace D A, Cooke R J S, Dent V F, Norris D J, Johnson R W, 1981. Kadovar volcano and investigations of an outbreak of thermal activity in 1976. Geol Surv Papua New Guinea Mem, 10: 1-12. There is no Deformation History data available for Kadovar. There is no Emissions History data available for Kadovar. 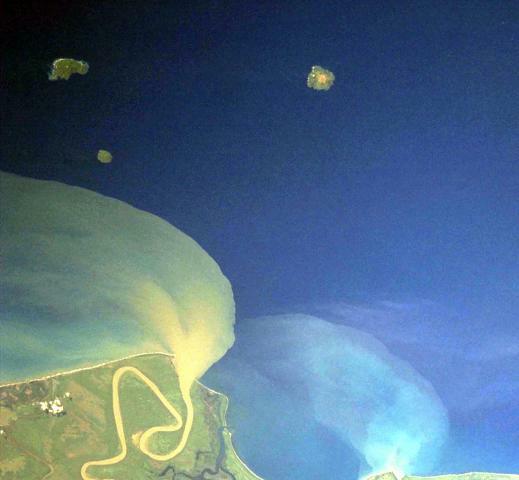 The small circular island at the upper left just above the prominent sediment plume from the Sepik River (lower left) on the mainland of Papua New Guinea is Kadovar volcano. The 2-km-wide island of Kadovar is the emergent summit of a youthful stratovolcano of Holocene age that lacks fringing or offshore reefs. No certain historical eruptions are known; the latest activity was a period of heightened thermal phenomena in 1976. 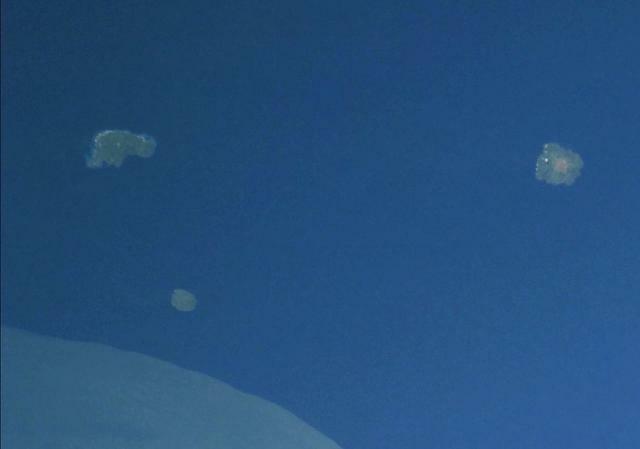 Kadovar is part of the Schouten Islands, along with Blup Blup (upper left) and Bam (upper right) islands. NASA Space Shuttle image STS106-719-49, 2000 (http://eol.jsc.nasa.gov/). The small island with the irregular shoreline at the upper left is Blup Blup. This 3.5-km-wide forested island contains lava flows with well-defined flow fronts, and a weak thermal area is located on the west coast. No historical eruptions have occurred, but the volcano may have been active during the Holocene. Blup Blup is part of the Schouten Islands, along with Kadovar volcano (the small circular island to the south, above the prominent sediment plume at the lower left) and Bam volcano (right). There are no samples for Kadovar in the Smithsonian's NMNH Department of Mineral Sciences Rock and Ore collection. IRIS seismic stations/networks Incorporated Research Institutions for Seismology (IRIS) Data Services map showing the location of seismic stations from all available networks (permanent or temporary) within a radius of 0.18° (about 20 km at mid-latitudes) from the given location of Kadovar. Users can customize a variety of filters and options in the left panel. Note that if there are no stations are known the map will default to show the entire world with a "No data matched request" error notice. Large Eruptions of Kadovar Information about large Quaternary eruptions (VEI >= 4) is cataloged in the Large Magnitude Explosive Volcanic Eruptions (LaMEVE) database of the Volcano Global Risk Identification and Analysis Project (VOGRIPA).